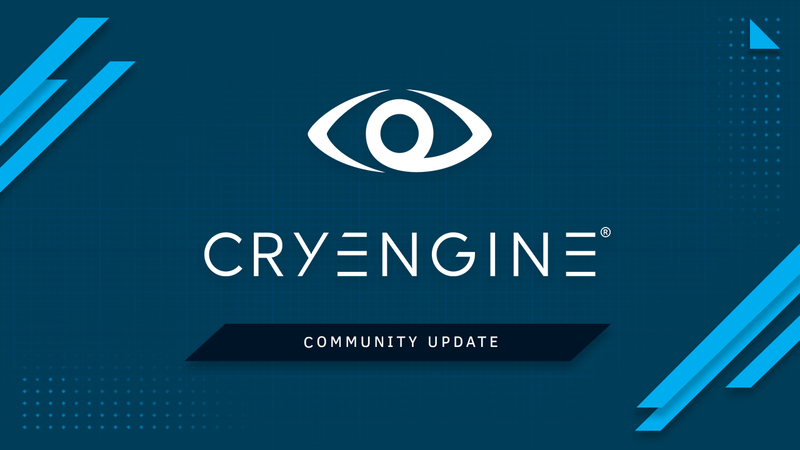 CRYENGINE is always evolving and we want to keep being as transparent as possible as we move forward and make the engine the best it can be for everyone. To start the week, we wanted to highlight a couple of topics which have been of particular interest on our community channels: Sandbox source code and documentation. With 5.4 we announced the intention of releasing the Sandbox source code. The intention to make the source code available remains. However, as you will know, development – and engine development – is not always straightforward. We are making progress on internal tech and legal checks on the code to make sure everything is cleared to go live, and, in parallel, we are looking into the right model to make this code available. Anyone who has worked in development knows that sometimes delays, while regrettable, are sometimes unavoidable. “It’s ready when it’s ready” is always the best approach rather than rushing something out. However, we want to assure everyone that we continue to work towards giving users access to enhance the Editor and contribute to alleviating pain points by submitting fixes and contributing directly to the development of the engine. We are currently working on how the source code should be released and that may mean that we make amendments to the business model which we currently use. We fully see the need for an API that users can simply tie into without having to have access it, a model similar to other industry-standard solutions. On the other hand, we also recognize the benefit for other users to have access to the Editor code which will allow for further expansion of the engine. Our intention to make the source code available is a big pivot for the company and we want to get it right. We want to empower the community, but without jeopardizing the interests of the business on which the development of the engine ultimately rests. We are currently evaluating the best way to achieve this for everyone. So: Tech stuff, legal stuff, and business stuff all plays a part in delivery. We are working on it. We’re not there yet. Watch this space. With the push for 5.4 many of you in the community knew that we were focusing on the common request of improving our documentation, with a particular focus on getting more organized and up-to-date. Our main goal here is to structure the docs with more of a focus on discipline rather than a specific technique. Part of this means we will be splitting out categories as shown in the picture below. You will now be able to navigate directly to a “Getting Started” section or particular topic, for instance, animation, if that is what you happen to be interested in. Regarding timelines, we are still aiming for the 5.4 cycle. However, due to some of the changes across 5.5 and the new skin for the editor we are going through the process of scrubbing legacy documentation so everything is upgraded to the latest workflows on release. We are still rolling out regular and constant updates to current documentation and a complete restructure is the goal within the coming months during the 5.4 release cycle. We have already covered many topics within the Preview phase that have been received well and this work will continue. 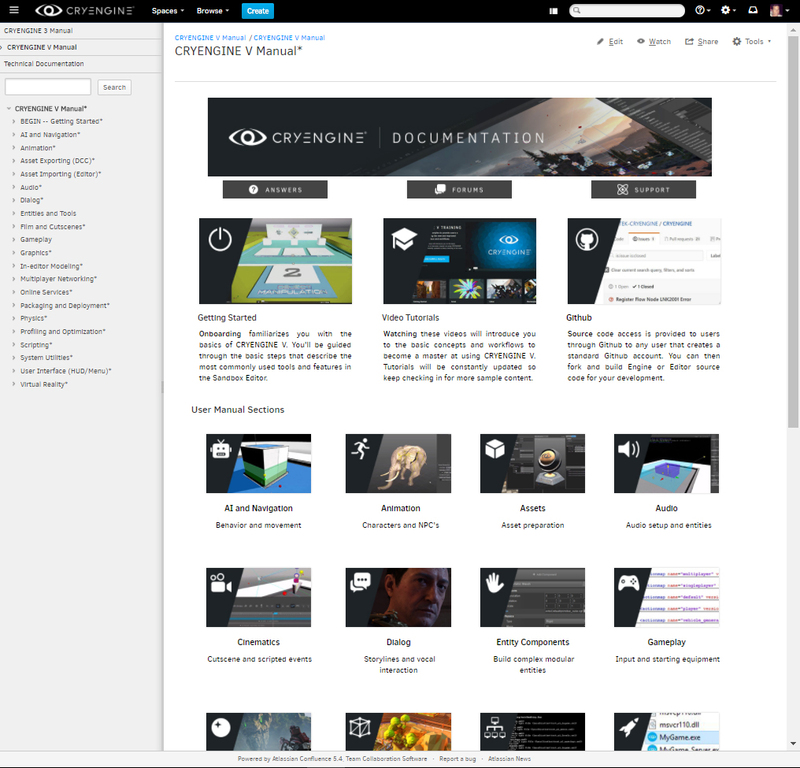 WIP screenshot of documentation overhaul in progress. The learning restructure also looks to shift away from routine tasks to become more about completing solid game loops that could be repurposed or expanded upon within your own developments. The scope of this work will cross both written and video material as we have always done. Our aim is to deliver a learning offering that will give you everything you need to create mini-projects which will help you become familiar with important systems in the Editor. As part of achieving this goal, we have also hired a dedicated new Learning Manager who has the remit of evaluating and improving the educational material offered within our portal and externally. Expect more in an upcoming blog post, where we’ll have more detailed information about the direction of travel and a bit more about this new member of the CRYENGINE team. I think you will be surprised and happy to see the speed and shape this initiative is taking. Down the line we may tackle more topics that are common themes throughout the software industry, rather than CRYENGINE specifics. The focus on learning will be to follow and exceed industry standards and make the engine enjoyable to learn and grow with. Our ambitions are as bold as yours, and while it will be a steep learning curve for us, we are committed to making the progress we recognize we have to make. Can't wait to see what you guys are up to. I hope you have updated content examples similar to Ue4, which allows us to take it apart and learn from it. We are currently working on how the source code should be released and that may mean that we make amendments to the business model which we currently use. We want to empower the community, but without jeopardizing the interests of the business on which the development of the engine ultimately rests. We are currently evaluating the best way to achieve this for everyone. Does this mean that the regular cryengine licensing model will change as well? It can be read between the lines that changes might not affect only sandbox source code, could you clarify this for us? Revisions to terms affecting existing CRYENGINE shall be effective thirty (30) days after posting at http://www.cryengine.com. If you do not agree with the new terms your only remedy is to stop using CRYENGINE . , which means we don't know what we are getting into (as Crytek can change the deal within 30 days) and additionally now, we don't know what kind of business plans Crytek are making for the engine (which we as engine users have to agree on or just simply stop developing with the engine). The new docs look fancy. Finding something specific will be much easier! 1. Amendments only expand the business model and it is quite clear based on the article that we are exploring multiple ways to monetize the code. Things in the future can always change but we will only approach that when we reach that bridge. For now the amendment would affect the Source code offering which is the intention of the response and transparency. Free is not going away and accessibility to the engine is always the largest goal while minimizing overhead. 2. This is simply phishing for anything because let's put aside the specifics on Crytek. We notify you and give you 30 days while competitors of ours don't allow any notice to change the terms. Completely standard for any site online if you don't agree to their terms. Ranging from software usage to the acceptance of cookies. ******* reserves the right, at its sole discretion, to modify, discontinue or terminate the Site or Services or to modify these Terms, at any time and without prior notice. If we modify these Terms, we will post the modification on the Site or otherwise provide you with notice of the modification. The scope of this work will cross both written and video material as we have always done. Our aim is to deliver a learning offering that will give you everything you need to create mini-projects which will help you become familiar with important systems in the Editor. More than anything else, this is what's really getting me excited about the future of the engine. Between the abundance of learning resources, sample projects, full projects, and https://www.udemy.com/unrealcourse/ it's ended up becoming the reason why I've been using the UE4 for the last few years. If I wanted to actually make a functional game, the barrier to understanding and using the CryENGINE was significantly higher. Epic provided sample projects for every type of game someone might want to make, an asset zoo of how to use every function in the engine, as well as the source to UT4 and Robo Recall for anyone to look through. What will be really interesting is to maybe even go a step further than that and make the sample projects and tutorials/documentation have simultaneous releases in both C++ and Schemytic, introducing people on how to use both systems at once and giving a good bridge for people that know one system and want to tackle the other. I'm not sure if making a UE4 material editor equivalent is in the cards at all, but if not, a series on how to edit CryENGINE shaders and work with them would go a long way as well. One of the biggest problems I ran into when trying to learn shader code is a lack of good documentation on how to use any of it with the major existing engines instead of them saying to basically start from scratch. Finally, just throwing this in there since I know schools teaching animation and game creation can benefit from it, at some point try to look into a completely plugin-less system to make projects. No Photoshop plugins, Maya plugins, Flash plugins, any of it. It makes it a lot harder for sys admins to maintain since conflicts can come up and interfere with what other classes need, like how for a long time CryTIFF broke .tiff support for normal files. I know this one's probably a bit further off, but if that's a space you want to see the engine made available in at all, you need to make it more self contained. Bonus points if you get Schemytic to a point where you can make and work with projects without needing Visual Studio installed. and that may mean that we make amendments to the business model which we currently use. Requiring users to pay for Sandbox source is rather counter-productive considering the direction the engine has gone over the past two years. Paying for Sandbox access in the past worked because ALL USERS got an up-to-date useful program out of it which they otherwise wouldn't have had. Making existing users of your free tech pay for additional access levels just doesn't make sense. It doesn't provide any additional quality of life or utility. It just forces them to make a design decision surrounding their game. "Do I pay for Sandbox source code and hope I can do more things with it or do I design my game within the limitations imposed by the existing bounds?" Those that would seriously make use of it are already those most likely to bring you income. Making them pay for access is just milking them for more. Keep in mind that the cream of these very people are those that would likely be recipients of the, for some reason still, nascent Indie Fund where you give them money instead. Your current business model concerning the engine is pay what you want. PWYW makes Cryengine have a free to develop licensing model and a royalty free distribution method. When I look back to the beginning of EaaS and start connecting the dots of events leading up to the release of CEV, I have a pretty decent idea of what happened. I can understand there's a desire to lead back towards that direction, but breaking Cryengine's free to develop nature is a step backwards across all fronts. It shouldn't even be considered until the official support resources that have been on the horizon, for nearly two years now, are in place. There are things I want to do with the engine that I'm not sure if it's actually possible or feasible. Barebones fp64 large world for example. It's theoretically such a simple idea; just change one line of code, of which I already have access to, and then rebuild everything. I know there will be side effects, but I can't tell how they would affect my game ideas until I have a sandbox experience within Sandbox. That means I must have Sandbox source code. I live in the richest country in the world, but I am dirt poor right now and am only surviving (literally) by the graces of my family. I know that most people are able to, but I'm not in a position to just toss money away to try various ideas. The sheer uncertainty regarding the amount of time I'd have to spend just to familiarize myself with new code makes this prospect even more undesirable. From the beginning of CEV, Crytek has said "we hear you" when it came to editor source. Eventually, that turned into an announcement that it would be exposed with 5.3. That release was held back to 5.4 after some licensing issues arose. Now, well after 5.4's slow yet massive iterative release, we're hearing that we may not actually get it as we were told? Please just follow through and publicly expose it for free. Dishonesty is not good trait for a company. Often times, one dishonest action can cripple a business. Even if the business itself isn't ruined, its relationships with others can easily be irrevocably spoiled. To be frank, Crytek doesn't have the best of reputations right now. It's boggling my mind that such things are being considered. Cryengine is a great engine. No dobut about it. Getting straight to the chest, I'll gladly pay for the editor source unless it is out of my budget. I really like pay what you want business model. Once my game gets to a shippable state, I'm willing to make donations. But then there is people who are not as big a fan of cryengine(or too big a fan) as me. And their opinions should be respected, too. But, as a programmer, I know how much pain and effort must have gone into making the editor source customizable. If it is "out of the box and ready to go", I wouldn't mind paying for it. I dont' know what is best for them. Both sides have a valid point. Once they make an accouncement, it's hard for them to reverse their decision.